HandShoe Mouse owner and producer Hippus N.V. and Good Use Company, owner and producer of the Microdesk, have announced a strategic partnership. Hippus will from now on promote and distribute the Microdesk in Europe as a first step in its’ product expansion program. HandShoe Mouse owner and producer, Hippus N.V. and Good Use Company, producer of the Microdesk, have announced a strategic partnership going forward. The partnership will expand the Hippus product range and will have the benefit of creating more visibility for Microdesk in the European market. This is a first step in the strategic expansion of Hippus with other ergonomic products. In the near future, Hippus customers can expect more products, related to ergonomic comfort at their desk and a better working posture. As usual, the new products will be available from Hippus’ stock in the Netherlands. As part of a long-term strategy, the two companies plan to offer more potential products in the European ergonomic market. When asked about the new joint venture, Drs. Sjoerd Eisma, CEO of Hippus N.V. said, “This is a fantastic next step in our planned expansion of ergonomic product offerings”. Chris Mahoney, Director of Good Use Company, is also excited about the venture, saying “It’s great to co-operate with the HandShoe Mouse team, who already have a strong presence in Europe”. Current and future customers are invited to learn more about the Microdesk and how they will benefit by visiting the website at themicrodesk.eu. when it was noted thst many students couldn’t finish their exams, due to pains hand and/or wrist while using a small, standard computer mouse, which in many cases resulted in Carpal Tunnel Syndrome and/or Repetitive Strain Injury (RSI). The university development team found and proved that a mouse which fully supports the hand at an angle of 25-30 degrees helped to prevent these “mouse pains”. For many years, the HandShoe Mouse is being sold globally, through a network of first class ergonomic distributors and resellers. 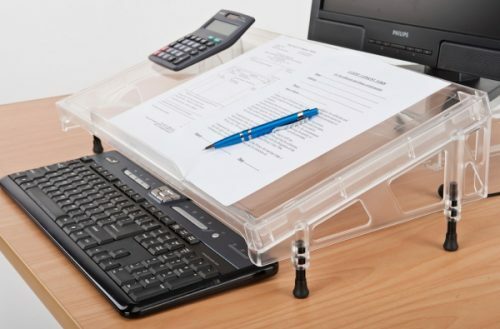 Good Use Company was founded in 1996 and serves the Office Products Market with the Microdesk and several other products such as monitor arms, Secure Cord (TM) and Fluteline Footrests (TM). The Microdesk is the ideal solution to improve working posture and increases comfort at the desk, while it instantly adds useable working space. Moreover, it reduces the need to reach, stretch or twist to interact with paperwork.